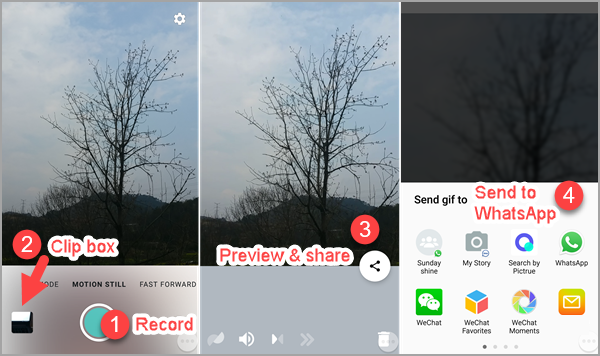 Online resources and apps of GIF for WhatsApp are already plentiful and easily accessible in mobile phones, but in this part, you’ll learn to create your own GIF motion images by recording or converting from videos. Motion Stills is an app made by Google aiming to help iOS users do more with their Live Photos, including stabilize Live Photos and turn them into sharable GIFs. In July 2017, Google brought the app to devices running Android 5.1 and later. With this app, everything you shoot is transformed as short clips and can be shared to WhatsApp contacts, groups or even My status. Here we take an Android device as example to show how to do it. iOS users can also easily make GIF with the same app or Gboard. Step 1. Download and install Motion Stills to your Android phone. Step 2. Run the app, then tap the shoot button to capture what you want. Step 3. The recording will finish automatically within 2-3 seconds. Step 4. Tap the left box to view the clips you created. Step 5. On the full preview screen, tap Share button, and then choose GIF. Step 6. From the available share options, choose WhatsApp, then share the GIF to someone or a group. You can also explore more fun in AR mode and Fast forward (longer clip at higher playback speed). However, basically, Motion Stills is a simple application for making GIFs. Don’t expect too many editing options on it, especially for the Android version which is usually updated later than the equivalent on iOS. 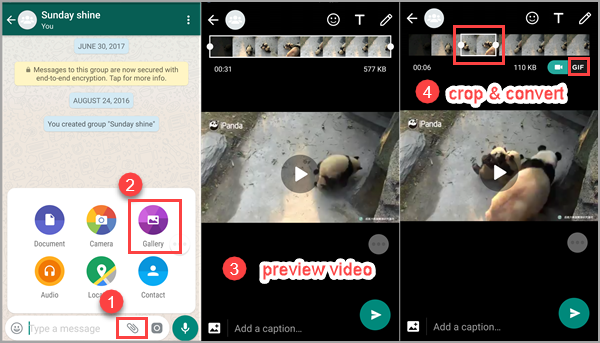 WhatsApp allows users to convert local videos into GIFs with each clip as long as 6 seconds. This is very useful when you want to crop a short clip from a video on your phone and share it as GIF to your WhatsApp contacts. This works for both Android and iOS devices, but the exact operations may vary due to the differences of app version and OS platform. Step 1. Open a conversation on WhatsApp, then tap the clip icon in the input box. Step 2. Choose Gallery from the pop-up list. Step 3. Find and preview the video you need. Step 4. Scroll from the start and end of the rectangular box to shorten the video to the time frame you want to share, which should be no longer than 6 seconds, or the GIF option won’t appear. Step 5. Choose GIF from the newly appeared icons. The GIF will start preview automatically, and you can still add text or emojis to it. Step 6. Tap the Send button to share the GIF to your friends. 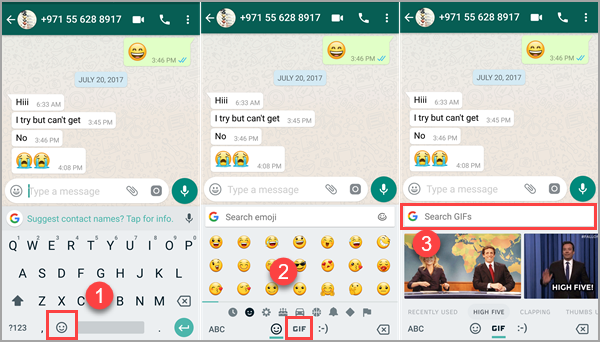 Since version 2.17.6, WhatsApp has been supporting Giphy search option. Users can search for online GIFs within WhatsApp and get satisfying results from Giphy’s huge library. Step 1. Start a conversation on WhatsApp, then tap the emotion face in the bottom left corner. Step 2. Choose GIF icon in the bottom of the screen. You will see popular GIFs under the input box. Step 3. Press the magnifying glass in the bottom left, then enter a keyword to search for GIF via Giphy. Step 4. Select an animated GIF from the results and tap Send button to share it to your friend. As an indispensable part of conducting a conversation in social apps, virtual keyboards are integrating more and more functions, including emojis and GIFs. Gboard, for example, is one of the best keyboard apps that support GIF searching and sending (and even GIF making, which is only available for the iOS version for now). You can also find other keyboards with GIF on Android and iOS app store. Step 1. Install Gboard (Android & iOS) on your phone, then set it as your input keyboard by following app guide. Step 2. Start a conversation on WhatsApp, then tap the input box to activate Gboard. Step 3. Tap the emotion face in the bottom, then choose GIF from the bottom bar. Step 4. Type a keyword in “Search GIFs” box and proceed. Step 5. Choose a GIF from the result and tap the Send button. GIFs provided by keyboards are great alternatives when you can’t find appropriate motion graphics via Giphy. After all, we can access both of them on WhatsApp with no conflict. 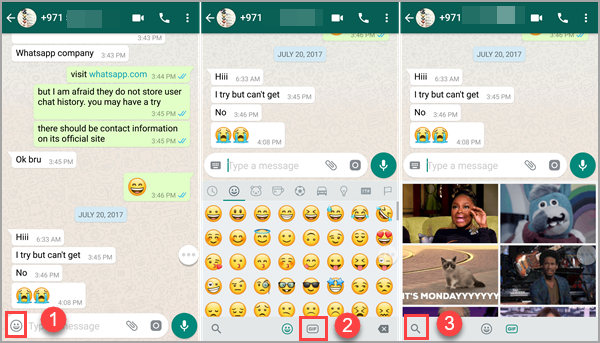 How to Add Contacts in WhatsApp with WhatsApp Web?